I’ve passed this shrub hundreds of times while walking the dog, then decided to photograph the small berries a couple of weeks ago. It’s a wild strawberry bush, also known as Euonymus americanus L., American strawberry-bush, Brook euonymus, Hearts-a-burstin, Bursting-heart and Wahoo (my personal favorite). Birds and squirrels eat the berries, but they must not be real tasty, because a lot of them remain on the shrub. All for now. I’ve been battling a virus for the past 4 or 5 days and have gotten behind in everything else. I’m rarely sick, so this has been frustrating. I can’t help but think of the bloggers and photographers I’ve met through the blog who are battling pain and/or disease every single day. I don’t know how they do it. My hat is off. We’re going to Florida for Thanksgiving, so I’ll be getting ready for that in the next few days. I’m going to post one photo each day for a while, maybe until the holidays are over. I may throw in a quote or two. I love great quotes. 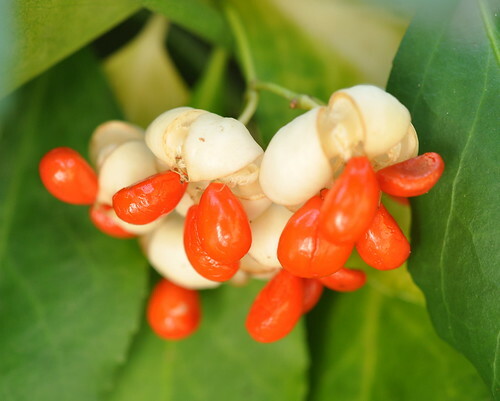 This entry was posted in photography and tagged American strawberry-bush, Brook euonymus, Bursting-heart, Euonymus americanus L., Hearts-a-burstin, red berries, Wahoo, wild strawberry bush. Bookmark the permalink. I love a great quote too 🙂 I am jealous that you are going to someplace warm for Thanksgiving!! Oh and since I came to see the photo I should say something huh 😛 It is a beautiful shot, I love the contrast of the colors and the composition is fabulous! It’s actually warm here, strangely enough. I don’t remember an autumn so warm on the East Coast. Actually saw a hibiscus blooming outside this a.m.! The berries look familiar, think I have seen them in Europe too. Hope you get better soon. It’s so annoying to be ill. Quite humbling too. Yes, very. Thanks, Caroline. Hope you enjoy the book. I hope you feel better soon! I don’t get sick often either, so when I do, it’s very frustrating. I hope you have a nice trip to FL! Feeling much better today, thank you!